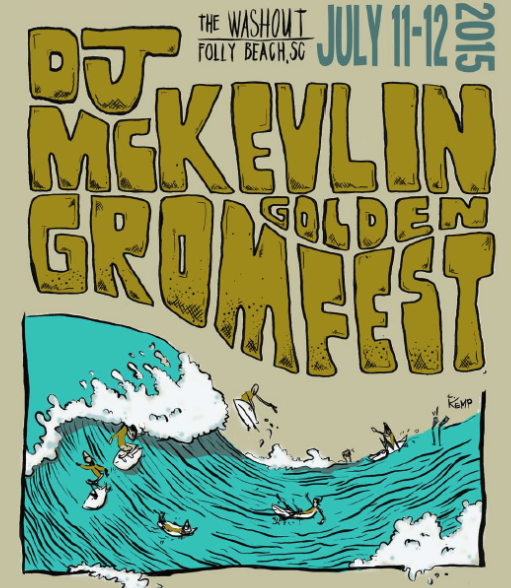 This year’s McKevlin’s Gromfest is scheduled for July 11 & 12 at the Washout, Folly Beach. Since this is the shop’s 50th year, we’ve re-named the contest – the 2015 D.J. McKevlin Golden Gromfest. Competition and Prizes: There will be a total of 10 divisions for Girls and Boys 18 years old or younger. Every contestant (regardless of placing) will be entered in the FREE raffle for a brand new …Lost Surfboard of their choice AND a GoPro Hero 4 Black camera. Everyone also receives a FREE contest t-shirt created by artist, Chris Kemp. All finalists in every division receive a valuable prize package full of goodies from our sponsors including a …Lost SurfSkage. And, the top 3 finishers in each division receive Golden trophies! Throughout the contest we will have prizes and games for everyone on the beach including skill challenges conducted by our friends from Sky Zone.